This printed slip mat is 10.5" in diameter. It fits most standard turntables. The slipmat is used on a turntable to slide one record off and a new record on again very quickly. 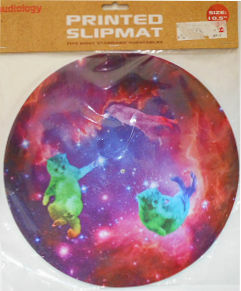 This slipmat is decorated with 3 cats floating in outer space. Package is unopened.